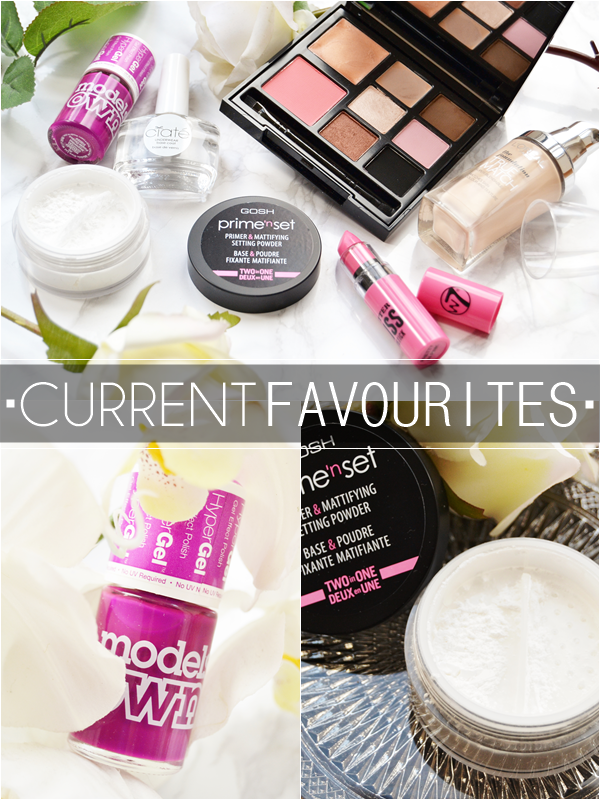 A new month and some of my current favourites for you! 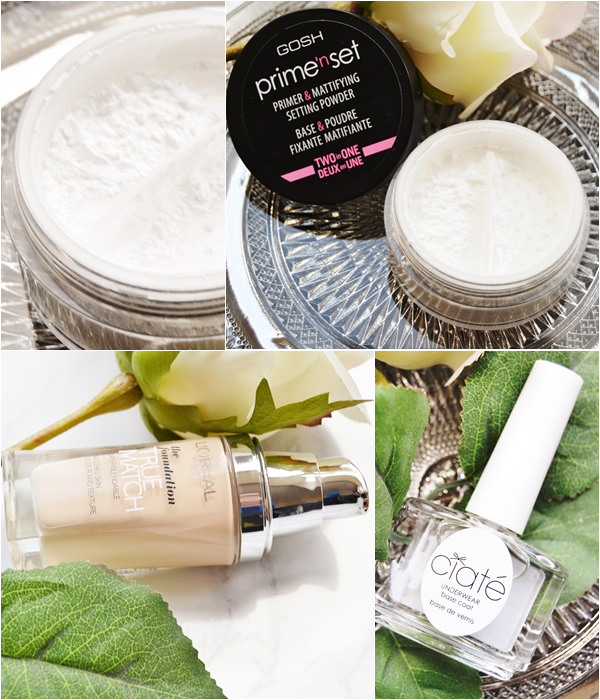 In the last month I seem to have had an influx of products to try, both PR samples and my own spending, which has resulted in finding some amazing new favourites. I love primers. I love silicone based primers most, my skin doesn't! So when this new powder primer from Gosh entered my life I was eager to try it... though I'll admit I couldn't imagine it working well. But thankfully it does and I've been reaching for it more than my other pore-suffocating primers! To use - the scarily white powder is simply dusted over the face pre-foundation as it's thankfully translucent, then any type of foundation liquid/powder/cream can be applied over the top. 1. This means no drying time 2. It's totally light weight on the skin 3. It's gonna last you a life time compared to a liqiud primer. Then you can optionally dust it over the face to set everything, I'm still in love with my Clarins Loose Powder so I rarely use it for that purpose. I've been using this for around 3 weeks now and it's possibly the best oil-controlling powder I've tried - it keeps my T-zone shine-free nearly all day and my foundation from wearing. PLUS I'm convinced this diffuses my pores somewhat before foundation. The price is a little steep for a high street powder product but I'm sure this will end powder/primer buying for a lot of people, especially oily skinned girls! I'm also thinking this will be amazing in summer when no one wants to add more layers onto their skin than necessary! I'm currently rotating around 9 new foundations and this is one of them! The life of a Beauty Blogger - someones gotta do it! And this is one of my clear favourites due to how well it matches my own skin tone and is able to correct the slight redness I had. I could put this down to getting lucky picking the right shade but I true believe this range is possible the best on the high street for suiting different warm and cool tones of skin. This shade is thankfully a cool porcelain (so many pale shades are warm toned) and with it's light weight formula just blends into my skin a dream. It's been my go-to foundation on natural looking skin days and it's actually making me a lot more confident in how my skin looks without having to reach for a more opaque coverage. Clapping emoji at L'Oreal for this one! If you want to save your nails from turning yellow then a base nail polish is a must. I learnt the hard way a few years ago and after letting my nails grow out I swore to always use a base coat and I've actually stuck to it. It's surprsingly not that hard to remember to use once you throw it into your nail polish routine and your nails will definitely thank you for it. Also if you have ridged nails from over using nail polish, like myself, then it's a god send. So after my beloved China Glaze Ridge Filler Base Coat glooped up I moved onto Ciate's Underwear which has recently had a makeover. I'm not overly impressed with how it looks as for £12.00 you'd think Ciate could make sure the ugly label couldn't be seen through the glass bottle but that's by the bye I guess. It's if it does the job that mattes to me and thankfully it's a good one. This smooths over the nails easily with a thin but not too thin formula and dries fast. I've personally found two coats is perfect for smoothing over my ridged nails but for someone looking to prevent nail staining a single coat would do the job. If you paint your nails a lot like I do, then this certainly does the job. Models Own have recently come out with some many new products making it hard to pick a favourite! 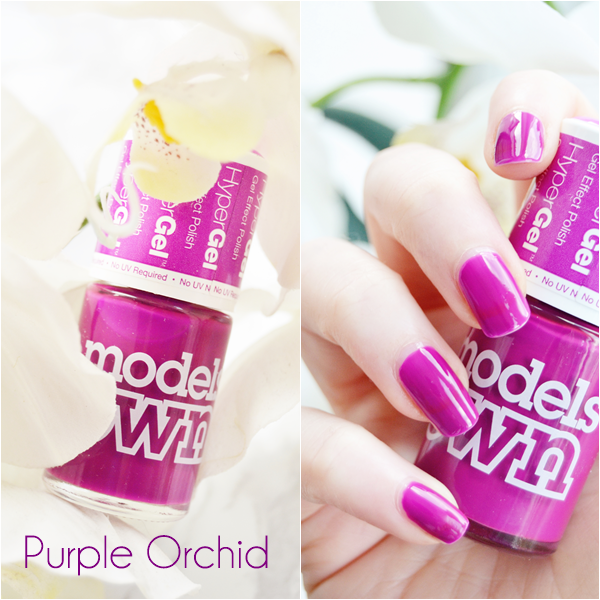 But due to the amazing formula and subtly unique shade it has to be Purple Orchid. The entire HyperGel range is one of my favourites from MO as the thicker glossy formula is exactly what I want from a nail polish. Plus I find the formula lasts on the nails with only tip wear and no chipping! As for the actually shade this is slightly darker in real life and a beautiful vivid purple on the nails that is actually quite unique in my vast nail polish collection. I'm also finding it spot on for this time of year as I'm not ready to sport any pastel shades just yet and darks are... well seeming too dark, making this a perfect transitional shade. Where to begin with this palette?! This sleek compact is truly what dreams are made of for a beauty lover. Encompassed in this palette are four beautiful eyeshadows (I personally use the pink shade as a blush), an eyebrow powder/cake, a cream contour pigment, cream bronze pigment and a stunning powder blush! I've had this palette for little over a month now and truly have got so much use out of it already - the middle two eyeshadows are just stunning, the blush in Hussy is fast becoming one of my favourite blushers and the eyebrow cake is perfect for statement brows. I've also been using the lilac-y pink eyeshadow as a light blusher but I've yet to use the black eyeshadow - I must get on it! The only fail product in this palette for me is the cream pigment in Hollow, it's simply too dark for my pale skin tone and looks a bit on the muddy side. 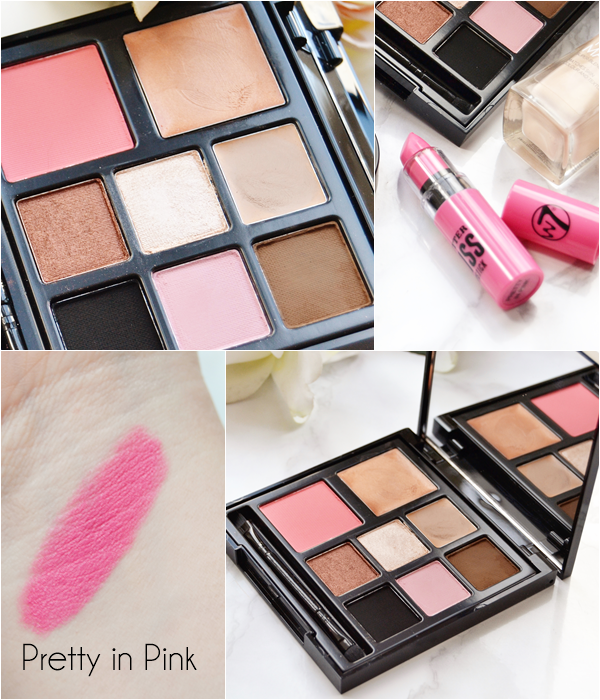 The palette also includes a huge mirror and is amazingly compact in depth, making this ultra travel friendly. Very much worth the lower price of £22.50. Last month I reviewed quite a few of the W7 Butter Kiss Lipsticks and loved them. A couple were on the sheer side but on the whole they rivalled the NYX butter lipsticks well and came out pretty impressive for the mere £2.49 price tag. Pretty in Pink has since not left my bag as it's a great pop of colour without being worried if it's all over my face! Aside from the vivid pink shade I'm in love with the creamy formula that's perfectly lightweight and lasts a good amount of time for a balm-type lipstick. Cannot wait to try out some of the brighter shades in Spring now! You can see more of my swatches of the W7 Butter Kiss Lipstick range here. What are you currently loving? Let me know! Blogger side note - Isn't it amazing when the lighting is perfect for photography and you take amazing pictures? This was today for me!